Coe's Dilemma: Does This Bribery And Corruption Make Me Look Complicit? Back in July, when in Sebastian Coe’s telling he was as pure and innocent as a spring lamb in the #2 spot at the International Association of Athletics Federations, he was in fact mulling over whether “we” in the West (meaning the US and Europe, maybe Canada, but definitely not Mexico) were being too hasty in our condemnation of bribery. And money laundering. And extortion. And blatant conflicts of interest. It turns out [Coe] is referring to what he calls “the new world order of sport”. This new order, he says, is going to confront us in the West with uncomfortable choices around cultural practices and political systems. For instance, bribery is a part of everyday life in much of the world. Do we reject any suggestion of accommodation with bribery and foist our way of doing things on the rest of the world – thereby exposing us to accusations of cultural imperialism? Or do we abandon our standards and fall in line with ‘different’ ways of doing things that we believe are wrong? It might be an ethics exam question called ‘Seb’s dilemma’. Have you ever seen so much stupidity, arrogance, guilt, racism, and weenie smarm packed into a single paragraph? Ruminating out loud, to a journalist, about whether bribery is the new honesty?! Hell, that’s the way these new world bastards do things, so bottoms up?! Let’s put this effluent in context. The slavering author spent a thousand words ticking off Coe’s many paying gigs—head of the 2012 London Olympic committee, first chair of FIFA’s ethics committee, vice-presidency at the IAAF, and chair of CSM sports marketing consultancy—failing to notice any conflict of interest. The author didn’t even mention Coe’s lucrative position as the top inside man in charge of promoting Nike. Careening onward, Coe called out the US for accepting staggering wheelbarrows of cash from newly wealthy business partners like China, but being a bit “sniffy” and “nervous” about the loot’s provenance. He seemed to be saying, from experience, that you have to be willing to bend over for these crass new players. He specifically mentioned Qatar, though his Senegalese boss at the IAAF, Lamine Diack, with his nepotism and his African clothes may have been on his mind as well. Cultural imperialism was a new one on me. Could it be true? In condemning bribery, which as Coe points out is an everyday practice in much of the world, are we guilty of foisting truth, goodness, and the American way on the rest of the world? To find out, I got hold of Ian Maitland, a professor in the Carlson School of Management at the University of Minnesota. His work concerns morality and ethics (usually the lack thereof), and international business. Bribe typically refers to a corrupt act that violates the law. So it is a tautology that all bribes are wrong (in the sense of illegal) wherever they take place. Plainly, in theory at least, a practice that violates the law in Stockholm may not violate the law in Riyadh, because the laws in the two countries are different. So I distinguish between ‘moral’ and legal bribes. So what is wrong about bribery? Morally what makes a bribe a bribe? I use what I call an ABC approach. For the exchange to be wrong (a bribe), B (and/or A) must violate some duty to a third person(s) C.
I define extortion as being threatened with being deprived of something one is entitled to. Fore example, A is entitled to renew his driver’s license. B is withholding the license in order to extort $25 from A, so B’s conduct is unethical (a bribe) while A’s action is not unethical (because A is being extorted by B). Applying the ABC framework, we see that Lamine Diack’s actions were bribery and corrupt, as judged by our universal standard. How do we know that? Well, clearly Diack violated his duties as a track and field official, to prevent doping and to bar athletes who failed drug tests from competing. In this case, C is the Olympic Committee. Diack failed to perform his duties to them. But C is also indirectly the other athletes that were placed at an unfair disadvantage by Diack’s actions, the countries that sent athletes to the games and who supported the Olympic Committee, the spectators who paid to see fair events, and so on. Even if the Olympic Committee itself was corrupt and encouraged and/or ordered Diack to fail to enforce the rules, he was part of its corruption, and he violated his duties to the other competitors, spectators and others. My conclusion is that Coe must not tolerate actions like Diack’s, no matter how common. Diack’s actions are not just a different way of doing things, they are wrong. They violate his, and his employer’s, commitments to a wide range of parties. For that reason, they undermine public trust in track and field and the Olympic games, and so endanger an institution that brings great pleasure to countless people. What about Coe’s assertion that in working more and more frequently with Qatar and Brazil and China will require accepting “different” ways of doing things? Actually, I think there is something to it. If you open an office in Qatar or Russia and you can’t get the electricity turned on if you don’t pay baksheesh, then you have to pay baksheesh. I call that extortion, not bribery, and if you are extorted you are the victim, not the perpetrator. Well, you might say, just don’t do business in Qatar or Russia. I disagree with that because a company that yields a large market to its rivals may jeopardize its own existence. So is Coe full of it when he talks about the new world order? Yes and no. No, if he needs to bribe an official to get the electricity hooked up so the track meet can take place. But, yes, he is full of it, if he allows his organization’s officers to accept bribes in return for violating his organization’s commitment to run a fair, drug-free competition. So, there’s no real dilemma here, other than how to not look so hideously guilty. The current scandal engulfing the track and field world has nothing to do with the IAAF and associated organizations and hangers-on paying bribes as a cost of doing business in developing nations, but rather receiving bribes for shirking their duties. 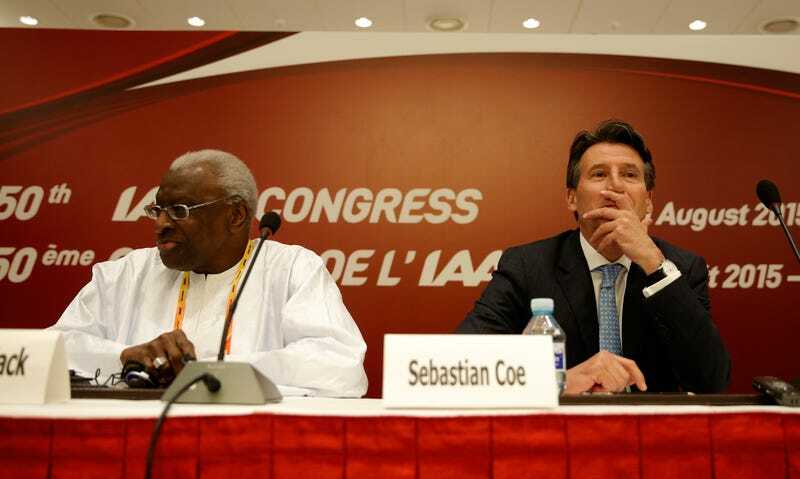 It looks like cultural imperialist is the most pleasant name Seb Coe could hope for. Accomplice, liar, money-grubbing traitor, and ouch, not very British are others that have been bandied about.